Derek and Tina and their beautiful boxer came to Brushstrokes today to paint our 20th anniversary Welcome sign. A true master, Derek perfectly captured my vision for this sign and we were all amazed at the speed and grace in his brushstrokes. I am asking Derek to teach a “Brushstrokes tips from a sign painter” class at Brushstrokes this fall. I believe he is on board. Who’s in? We are well into our 18th year of our art camp for kids! For a couple of years I have been thinking about launching Canvas and Wine parties at Brushstrokes. In May, we will begin this series of monthly evening events. These are works in progress of some of the paintings we will create together. Each month we will have a new painting project to follow as we get together for a 2 1/2 hour evening session to relax, hang out, paint and drink wine. The idea is to give people a chance to enjoy the simple act of creating without the panic of wondering what to paint. In the process we will learn a little about art history (where the inspiration for these paintings came from), we will pick up some painting tips and we will get a lovely finished piece of art to take home that night! Teachers include Kim Bennett, Lisa Solomon and Jessica Williams. At the sidelines of muddy baseball field, I overheard a man boast lovingly about his wife’s artistic skill and teaching ability. 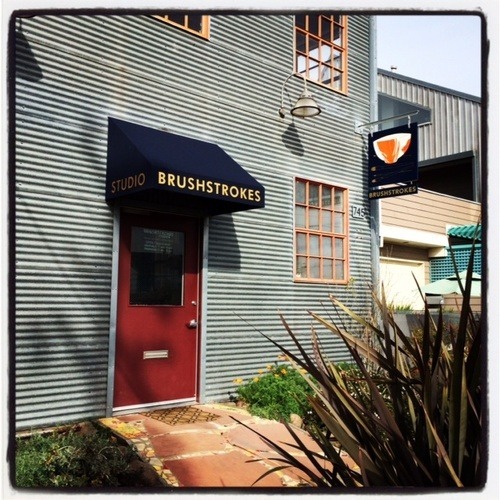 My ears perked up because I was looking for someone to teach color theory at Brushstrokes. I inserted myself into the conversation and found out more about Kim Bennett, who did in fact go on to teach a series of classes at Brushstrokes: color theory (Joseph Albers), painting composition (Bauhaus), and, most recently, “The Art of the Art Assignment.” Starting this month, she has been teaching Botanical Painting and Drawing on Wednesday mornings. We all convene in our upstairs studio with arms full of foraged branches and flowers. 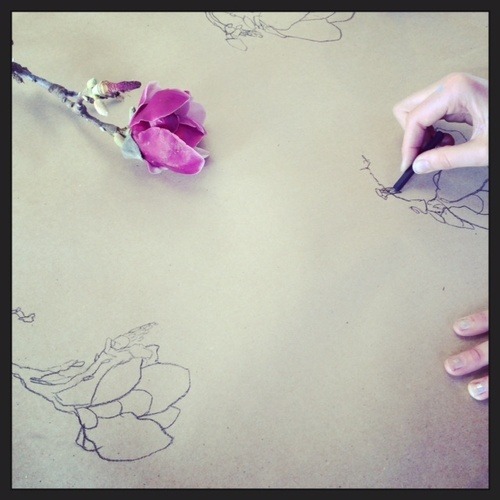 We cover the tables with butcher paper or delicate sheets of watercolor paper. We make pots of tea and listen to Andrew Bird. And we recite poetry. Kim and I share a passion for poetry and, in particular, Gerard Manley Hopkins who used drawing from nature as a way to inspire his poetry and deepen his understanding of creation and the Creator. I’ve been trying to memorize as many of these poems as I can. I can think of few things better than to have these words looping around my brain while I meditate on the beauty of a magnolia branch I’m drawing or painting (or while I’m unloading the dishwasher for that matter). It seems every time I ask my friend Shana to recommend someone to help me with a creative endeavor for Brushstrokes, the answer is always the same: ”Marina Luz." When I needed someone to teach hand-lettering workshops at Brushstrokes, Shana of course reminded me to get in touch with Marina. So we met eachother and I was enchanted with this Stanford-educated, Emmy-award-winning illustrator. She taught a series of relaxing, inspiring hand-lettering workshops at Brushstrokes and next we asked her to hand-paint a new sign for us. She designed and painted this lovely blade sign: a white rice bowl with a feather pattern, gold paint brushes and a shingle with a new, clean font for Brushstrokes. I’ve known Pam Paulson of Paulson Bott Press since the late 90s when her daughter Isabelle would spend the summers with me at Camp Brushstrokes (in trade for prints by Caio Fonseca). Isabelle is now at UCLA and comes back in the summers to be a camp counsellor at Brushstrokes. 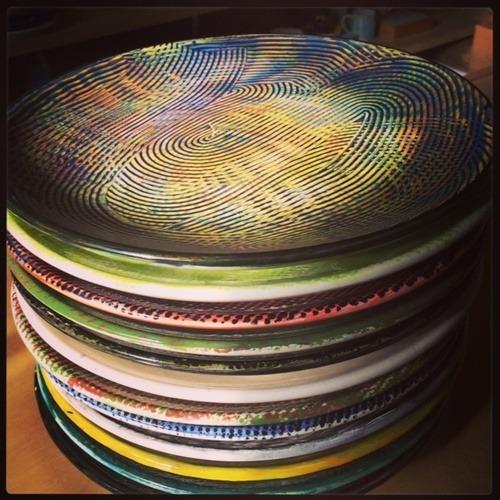 Meanwhile, Paulson Bott Press and Brushstrokes have continued to be connected through a series of artist-made dinner plates. Pam, her creative collaborator Renee, and the staff at Paulson Bott work with world-renowned artist on a series of prints. Then they throw a dinner party in honor of the artist. The artist and the printers will come to Brushstrokes and together create a series of plates on which dinner will be served. Each dinner guest is invited to take their plate home with them. The artists we have worked with include Squeak Carnwath, Hung Lui, Gary Simmons and Tauba Auerbach. 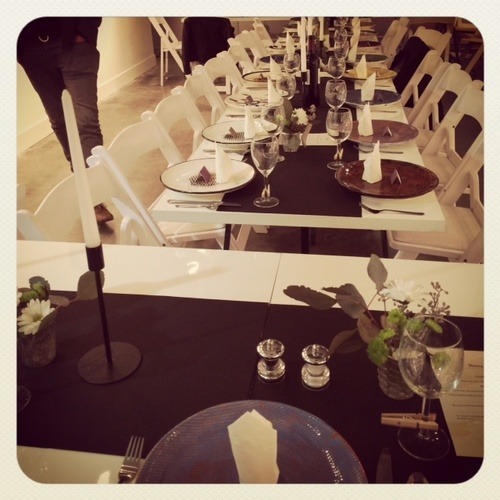 Above is a stack of Tauba Auerbach plates fresh from the kiln and below is a photo from the dinner in December. Thanks Marina for saying “how committed are you to that green?” We’ve been sprucing things up around the studio. Stay tuned for pictures of our new bar/counter being delivered to Brushstrokes at 5:00 this morning. Encaustics class started this week—loved these pieces by Alexandra and Christiana. Color theory class @brushstrokes also started this week. I love the handmade color wheel made of magazine clippings and scrap paper. We are all starting fresh.